Bring a touch of art to your table with this hand-painted Polish stoneware dinnerware. 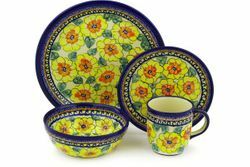 Polish pottery stoneware is extremely durable and will not crack or chip easily. This stoneware dinnerware set includes one each: dinner plate (10.75"d), salad plate (7.6"d), soup bowl (6.5"w x 2.5"h), and coffee mug (4"h x 3.6"d). The set is dishwasher and microwave safe.